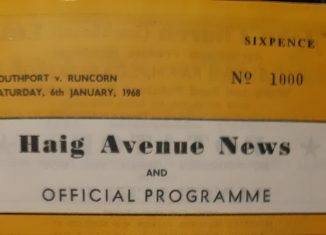 In 1968 non-league Runcorn visited Southport for an FA Cup 2nd round tie at Haig Avenue. As the national press hoped for a giant killing, Southport manager Billy Bingham was clear that in terms of approach, Runcorn were no different to Sir Alf Ramsey’s triumphant world cup side who were his opponents as the 36 year old was manager of the Ireland side beaten 2-0 at Wembley in November. Speaking to the Daily Mirror, Bingham commented: “My approach to Saturday’s match is exactly the same as it was at Wembley. The only difference is the level at which the game is played. In any match you have to adapt, exploiting the potential of the players you have. All you have to bear in mind is the standard involved. “We’ll Win. Ireland were the underdogs against England, this time Runcorn are the underdogs. And I know what it’s like being an underdog, so I’m determined there will be no slip-ups at our end”. With two special trains and over 50 coaches bringing the 3000 travelling supporters to Southport there was a bumper crowd, with Southport’s shiny new 1900 seater main stand on display. There were even rumours of a £20 per man win bonus for the Runcorn players. Following the game, Southport took the decision to increase gate prices for the visit of their third round opponents Everton. Having originally wanted to charge £1 for the stand and 7/6 for the Ground, Everton considered the prices too steep and took the dispute to the FA. Prices of 15/ for the seats (compared with 8/ for the Runcorn tie) and 6/ for the ground were settled upon with an all-ticket 19000 limited.